Rolls-Royce created this concept under FIMECC (Finnish Metals and Engineering Competence Cluster) user experience and usability program, UXUS. This future bridge operation concept for tugs is envisioned together with VTT Technical Research Centre of Finland and Aalto University of Arts, Design and Architecture in 2012-2013. By 2025, the first batch of autonomous vehicles will be driving through your neighborhood. But what about cargo ships? They’ll still have humans at the helm–at least most of the time–and this is the augmented reality bridge they’ll use to traverse the high seas. The tug boat bridge of the future will be fully customizable and feature augmented reality. The massive tiller and towering consoles are gone, replaced with minimalist workstations facing floor-to-ceiling windows that serve as a vast head-up display. The ship’s navigation information is overlaid in front of the crew, along with other vessel’s routes and obstacles that could be obscured by fog or rain. At night, thermal cameras display live video over the window to let watchmen keep tabs on what’s ahead. After inputting the ship’s destination, the navigation system determines the most economical route and uses a sea ice analyzer to avoid a Titanic redux. The bridge concept was developed by the VTT Technical Research Centre of Finland and Rolls-Royce. Beyond its multi-ton, high-dollar luxury barges, Rolls has a storied history in maritime development, building and developing engines, along with a host of other marine and aviations systems. The bridge of the future also extends to tug boats, with the OX concept that automatically detects the captain and then configures the workstation to both their size and needs. The user interface is fully adjustable for usability and visibility, and places augmented reality markers on the ship it’s towing to help with deckhand placement, predict the route of the vessel, and get real-time winch information. But autonomous systems are going to make their way into large vessels in the near future, and VTT and Rolls-Royce are already working on the first round of systems, which initially include remote controls that can be commanded from the bridge or on land. “In terms of the technology required, operating a container vessel by remote control is already a real possibility,” VTT says in a release. That’s going to happen before Rolls and VTT make the bridge of the future a reality, with plans to deploy the first remote-controlled ship in the coming years. Sifting data from 11 satellites, experts have determined that nearly a 1/2 inch (11mm) of sea level rise can be attributed to melting of ice sheets in Greenland and Antarctica since 1992 . This accounts for 20% of sea level rise during that period. Water from melting glaciers and ice sheets, along with thermal expansion of ocean water due to rising temperatures, are causing global sea-level rise. Scientists are exploiting satellite data to understand better just how much each component contributes to this devastating consequence of climate change. Latest estimates show that global sea level is rising by about 3 mm a year, and this is one of the major threats of global warming, especially for low-lying coastal areas. Identifying the individual contributors to sea-level rise is one of the most complicated challenges in climate science. This involves tracking water as it moves in all its forms – solid, liquid or gas – around Earth. While Earth-observing satellites continuously map global and regional sea-level change, they can also be used to quantify the amount of water coming from various sources. Under ESA’s Climate Change Initiative (CCI), experts in the domains of oceans, land, atmosphere and the cryosphere are working together to quantify the various sources of sea-level change – known as balancing the sea-level budget. “We have been reprocessing altimetry data from seven satellites to improve estimates of the global mean sea level and its regional variability,” said Anny Cazenave, Senior Scientist at the Laboratoire d’Etudes en Géophysique et Océanographie Spatiales (LEGOS) of France’s CNES space agency and leader of the CCI Sea Level project. “Bringing results together from other CCI projects, such as the Ice Sheets and Glaciers projects, is helping us to better understand the sea-level budget." Changes in the mass of ice sheets and glaciers can be mapped using satellite radar altimeters, like the one flying on ESA’s CryoSat that was specially designed to survey ice. By monitoring these changes, scientists can gauge how much water they contribute to the ocean. “Within the Ice Sheets CCI project, our aim is to monitor the polar ice sheets as they respond to changes in climate, measurements that will help us to better understand the origins of global sea-level rise and to improve the certainty of future sea-level projections,” said Andrew Shepherd from the University of Leeds, UK. The ice sheets that blanket Greenland and Antarctica have contributed about 0.6 mm a year to global sea levels since 1993, making them responsible for about 20% of all sea-level rise. Although this may seem small, their annual contribution has increased almost threefold during that period. While glaciers have been responsible for a larger fraction – 27% – their losses have been relatively stable over the past two decades. 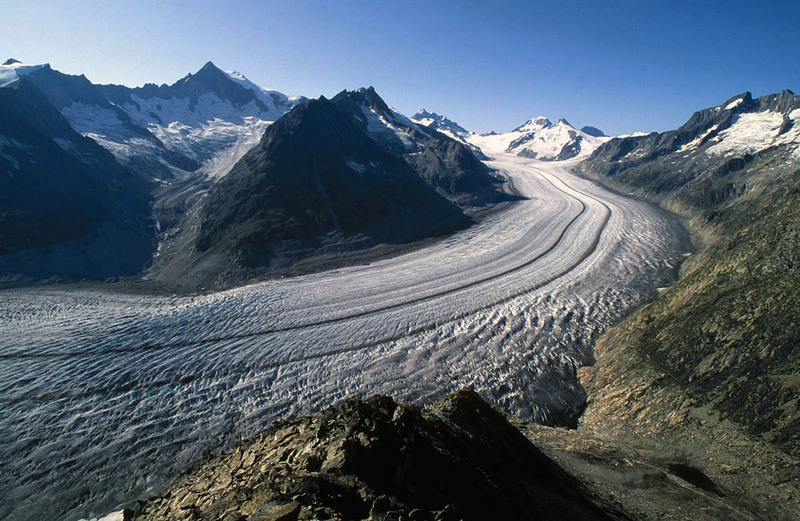 “We just recently compiled a new assessment of the glacier contribution to sea-level rise using the first globally complete glacier inventory and a wide range of input data either from satellite or field-based and other measurements,” said Frank Paul, senior scientist at the Department of Geography at the University of Zurich and leader of the Glaciers CCI project. An Atlantic bluefin tuna strikes. Crude oil from the Deepwater Horizon oil spill in the Gulf of Mexico causes severe defects in the developing hearts of bluefin and yellowfin tuna, according to a new study by a team of NOAA and academic scientists. Atlantic bluefin tuna, yellowfin tuna, and other large predatory fish spawn in the northern Gulf during the spring and summer months. In 2010, their spawning season directly coincided with the Deepwater Horizon spill. Their embryos, which float near the ocean surface, were potentially in harm’s way as crude oil rose from the damaged wellhead to form large surface slicks. “We know from the 1989 Exxon Valdez spill in Prince William Sound that recently spawned fish are especially vulnerable to crude oil toxicity,” said Nat Scholz, Ph.D., leader of the ecotoxicology program at NOAA's Northwest Fisheries Science Center in Seattle. Crude oil contains mixtures of polycyclic aromatic hydrocarbons, or PAHs. These PAHs adversely affect heart development in the two species of tuna, and an amberjack species, by slowing the heartbeat or causing an uncoordinated rhythm, which can ultimately lead to heart failure. According to the study, the thresholds for developmental defects are very low, in the range of approximately 1-15 parts per billion—within the PAH concentration range of water samples collected during the spill. Image shows a normal yellowfin tuna larva not long after hatching (top), and a larva exposed to Deepwater Horizon crude oil during embryonic development (bottom). The oil-exposed larva shows a suite of morphological abnormalities including fluid accumulation from heart failure and poor growth of fins and eyes. Severely affected fish with heart failure and deformed jaws are likely to have died soon after hatching. The NOAA team has shown in previous work that fish that survive transient crude oil exposures can suffer subtle and transient changes in heart rhythm during development. These changes can permanently impair cardiac function and swimming performance at later life stages. A major difficulty facing the researchers was access to live animals. Due to their fragile nature, it was next to impossible to assess the effects of Deepwater Horizon crude oil on live embryos and larvae collected in the vicinity of the spill. Also, there are only a few facilities in the world capable of spawning adult tunas in captivity. Instead, the team brought the oil to the fish. Samples of crude oil were collected from the field and transported to land-based hatcheries in Australia and Panama with spawning broodstocks of bluefin and yellowfin tuna. This provided access to embryos and larvae, allowing the scientists to emulate environmentally realistic crude oil exposures for both species. This study is a culmination of more than two decades of NOAA research on crude oil toxicity to fish early life stages. In the aftermath of the Exxon Valdez spill 25 years ago, NOAA discovered that PAHs from crude oil are highly toxic to the embryos and larvae of Pacific herring and pink salmon that spawned in oiled nearshore habitats. In more recent years, investigators at NOAA’s Northwest Fisheries Science Center have shown that these developmental deformities are primarily caused by heart defects. The effects of Deepwater Horizon crude oil on tunas were very similar to effects previously observed in other fish species exposed to oil. Given this consistency, the authors suggest there may have been cardiac-related impacts on swordfish, marlin, mackerel, and other fish in the northern Gulf. “If they spawned in proximity to oil, we’d expect these types of effects,” said Incardona. There's nothing easy about this. Searching for the debris of flight MH370 in the Southern Ocean is not just a case of looking for a needle in a haystack; it is a case of searching for a needle that moves hundreds of kilometres every day in one of the most hostile and constantly changing areas in the world. To make matters worse, it is also one of the most remote locations on Earth. I should know, I’ve seen this myself. In December 2013, I was on an expedition south of New Zealand to look at how dynamic the currents in this part of the world were. We deployed ten pairs of satellite-tracked drifting buoys into the ocean, at exactly the same moment and with only 10m spacing. Within days, the buoys within each pair were already at least kilometres apart. Three months later and some of the pairs are now separated by thousands of kilometres. If Malaysia Airlines flight MH370 did go down off the coast of Western Australia, given the distance from land and the nature of the ocean in this part of the world, it could hardly have gone down in a worse part of the ocean. The Australian Maritime Safety Authority last week released images showing two objects – one 24m, the other 5m in size – which led to a massive air and sea search of the area. 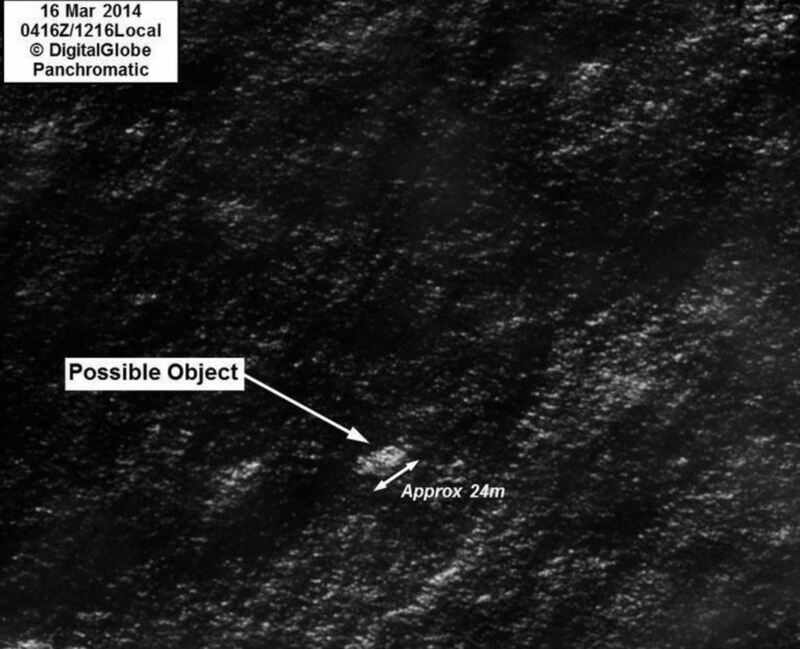 A photo released on March 20 by the Australian Maritime Safety Authority shows satellite imagery of objects that may be debris of the missing Malaysia Airlines Flight MH370. The region, just over 2,000km southwest of Perth, is extremely hostile. Winds and waves are among the strongest and highest in the world so any expedition to locate and possibly retrieve any wreckage and the plane’s black box will be difficult. Before the recovery of the plane can begin, assuming the debris are conformed to be those of MH370, the search team will have to estimate where the plane actually hit the water. That is not going to be an easy task. 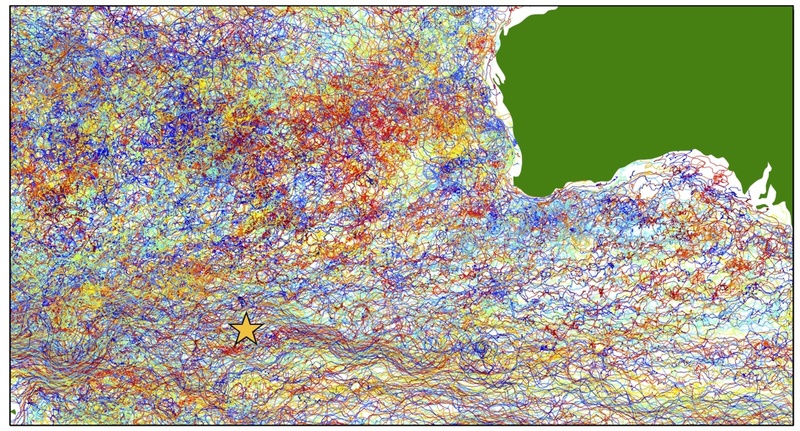 The Southern Ocean is extremely volatile, with currents changing speed and direction from day to day, making it particularly hard to back track the drift of debris to the original impact point. One of the unique features of the Southern Ocean is that it is the only place in the world where water can keep on moving eastward without ever hitting land. Because of this, and the strong winds, the water is swept along at very high speeds, sometimes almost 2m a second. This is much faster than any other place in the world. At those high speeds, the current becomes unstable. It starts breaking up and forms eddies. These eddies are similar to the vortices you may see behind wakes in a river or the spiralling and treacherous winds that can form behind tall buildings in the inner city on a windy day. This animation shows the rich dynamics of eddies and jets in the Indian Ocean sector of the Southern Ocean, which act to mix ocean waters. It shows a high resolution (1/20°) regional simulation of the Southern Ocean, including a peek at a submesoscale (1/80°) resolving nested simulation. The difference in the Southern Ocean is that these eddies are much larger - almost 50 km in diameter - and they are not stationary but constantly move around. The ocean here is chock-full of these eddies, which can also extend down for more than a kilometre. The underlying physics of ocean eddies is similar to that of cyclones and hurricanes in the atmosphere, but the velocities are much lower. The eddies are roughly circular areas of high or low pressure, and because of the rotation of the earth, water starts swirling around them. The stirring of the ocean eddies in the Southern Ocean make the flow of debris highly unpredictable. This is the oceanic equivalent of the butterfly effect, where a small change in initial position can very rapidly lead to changes in trajectory. Because of the stirring by the eddies, the sheer size of the search area doesn’t come as a surprise. It was recently announced that a Chinese satellite has spotted possible plane debris 120km southwest from where an Australian satellite spotted it two days earlier, and that a French satellite has spotted debris 800km to the north. 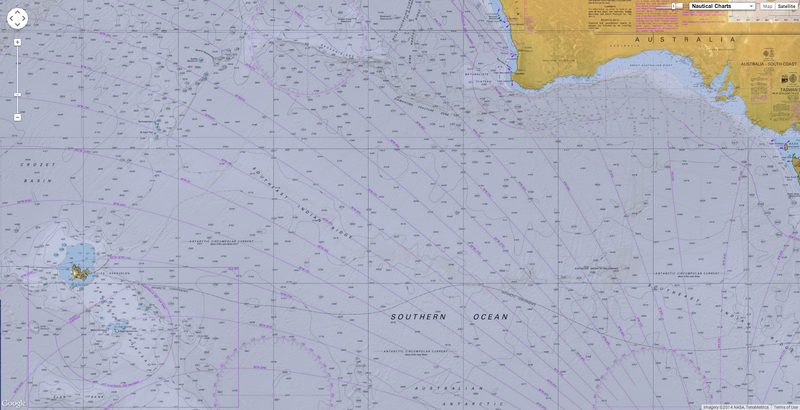 The map shows the movement of all the buoys ever deployed in this region of the ocean. The star marks the location of the objects identified on Australian satellite images. The pieces of floating debris from the plane will all have taken a different route through the sea of eddies. In fact, the debris that are still at the surface could occupy an area easily hundreds of square kilometers wide by now. If the search teams don’t find the debris soon, the remains of MH370 could even be in completely different oceans, as this simulation shows. This simulation was made up of the data trajectories of the thousands of drifting buoys deployed in the ocean over the last three decades. As you can see, some of the debris will move to the Indian Ocean off Perth while some of it will end up in the South Pacific Ocean. 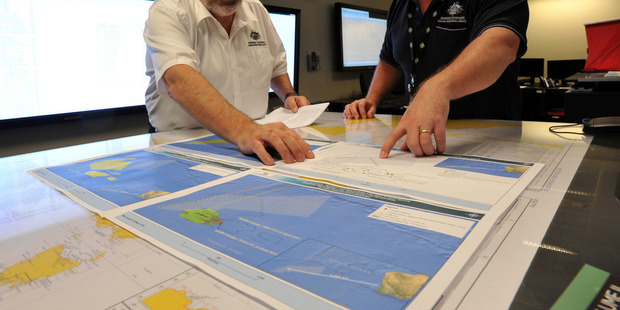 Mike Barton, rescue coordination chief, left, looks over the maps of the Indian Ocean with Alan Lloyd, manager of search and rescue operations at AMSAR. The ocean clock is ticking and if we don’t find something soon, it becomes increasingly difficult to find the aircraft. Voyager: How long until ocean temperature goes up a few more degrees? Of note are the changes in the Gulf Stream, El Nino and La Nina cycles in the Pacific, and the seansonal changes in sea ice cover. The average temperature of the sea surface is about 20° C (68° F), but it ranges from more than 30° C (86° F) in warm tropical regions to less than 0°C at high latitudes. In most of the ocean, the water becomes colder with increasing depth. At 2000 meters, (6,560 feet) the global average temperature is about 2.5°C (36.5° F), and at some locations the ocean bottom temperature is less than 1°C (33.8° F). The long-term warming of the oceans is strongest at the sea surface, temperature (SST) has increased by about 1°C over the past since 1910, or 0.1°C per decade. SST has been measured all over the world for more than a hundred years by ocean-going ships. Below the sea surface, historical measurements of temperature are far sparser, and the warming is more gradual, about 0.01°C per decade at 1,000 meters. The long-term increase of SST and the warming over the whole water column are both important in the physics of climate. Sea surface temperature is an important factor because it controls the exchange of heat between the ocean and the atmosphere and in so doing, influences the temperatures experienced on land. Heat content averaged over the full water column is important because over 90 percent of the net energy being absorbed by the earth’s entire climate system – in the air, ocean and on land and ice – is stored in the oceans. The oceans have much greater capacity to store heat than the atmosphere, and ocean currents and mixing carry heat away from the sea surface into the deep ocean. Over the past 50 years, heat energy has been stored in the oceans at a rate of about ½ watt per square meter of surface area. This is equivalent to having each 10 meter-by-20 meter area on Earth continuously warmed by a 100-watt light bulb. On time-scales of a decade or two, global SST fluctuates by about 0.2° C from year to year due to naturally-occurring climate phenomena such as El Niño and La Niña so the long-term warming trend is not evident in 10-year periods. That is the case in the most recent decade. Nevertheless, the warming over the whole water column occurs at a steadier rate than for SST, and indeed the heat content of the oceans has continued to rise in the past decade at the long-term rate of about ½ watt per square meter. So it would take a few hundred years for SST to increase by a few more degrees Celsius if it continues at the same rate as the past century. Climate models predict that the rate of warming will increase. However, even the moderate warming that has occurred so far is having profound impacts on marine life, sea level, and on Earth’s water cycle. 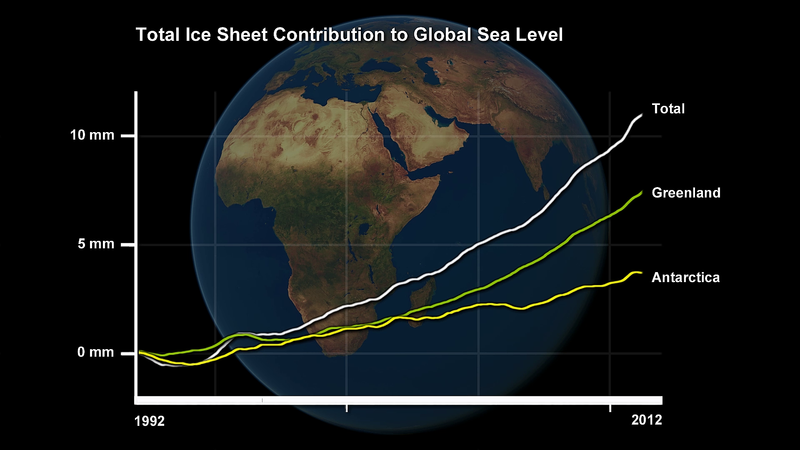 Sea level is rising by 2-3 centimeters per decade globally due to melting of glaciers and ice sheets and to thermal expansion of the seawater. Evaporation and rainfall have increased on a global basis as the warming ocean puts more water vapor into the atmosphere and more energy into global weather systems. Marine species are being displaced toward higher latitudes by the warming ocean, disrupting ecosystems. So while the rate of ocean temperature increase seems small, its effects on marine life, sea level, and the earth’s water cycle are the primary concerns for society.